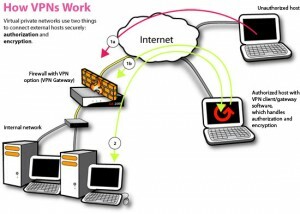 Today, we are going to discuss about some of the basic info about the VPN service. These are very basic details that you should be familiar with if you are planning to get a VPN connection for your internet connection. First of all we are going to talk about VPN tunnels and later we will also discuss some of most popular VPN protocols that are used by people around the world. VPN is a service that allows users to access the internet with full security and you should keep in mind this first of all. You should not just go and get a VPN connection without having complete knowledge about a perfect VPN service. Most of the internet users just buy a VPN connection without investigating much on different important factors and analyzing the pros and cons of different types of VPN available out there. When we talk about the VPN Tunnel, it is a virtual private passage which is based on an insecure channel, the internet. Now, the main feature of a VPN is to provide users with complete online security because it has become so much important in the current times where cyber crimes are on the peak. So, a VPN provides maximum security to the users’ internet data by passing it through this VPN tunnel. VPN Protocols Are Same as VPN Tunnels! Protocols are basically different types of VPN tunnels basically. It means that there are different types of VPN tunnels which are also called VPN Protocols and these protocols have different methods of encryption. PPTP, L2TP, SSL, SSTP and IPSec are some of the highly popular and most used VPN protocols. When we talk about the VPN protocols, you have to keep in mind that these protocols come with different type of security and encryption options. At this time you will find a lot of different VPN protocols, but here we are going to discuss the most basic and most popular VPN protocols for you. PPTP: PPTP or Point to Point Tunneling Protocol was developed by Microsoft in association with many other tech companies. It is the most basic as well as broadly supported VPN protocol. PPTP Protocol is basically an extension to the Point to Point Protocol which is responsible for transferring PPP packets through IP packets over any network. It is also the only drawback of PPTP protocol that it completely relies on PPP to provide security over internet which is not much reliable but still PPTP is the faster protocol among all. Previously, China and Iran were able to intercept PPTP protocol, so you can get the idea of the vulnerability of this protocol for there. L2TP/IPSec: Layer Two Tunneling Protocol is very similar to the above mentioned PPTP protocol. You can even call it an extension of PPTP but in this case it is being used by IP to enable the operation of a Private Virtual Network. This protocol was developed by Microsoft and Cisco. In addition to that, just like the PPTP protocol, L2TP is also unable to provide the real encryption and it relies on PPP Packets. It means that the difference between PPTP and L2TP is not only managing data confidentially but also data integrity. You will find many similarities in the PPTP and L2TP but L2TP is a bit slower. L2TP uses Pre Shared Key that increases the authentication function but that is not available in PPTP. Just like PPTP, L2TP is also vulnerable and highly unstable in internet censored countries. OpenVPN/SSL: Open VPN is considered as the most secured VPN protocol among all the other Tunneling protocols. It is basically an open source tool that is used to build point to point or site to site connection with SSL/TLS protocols. When we compare OpenVPN with PPTP and L2TP, it is a bit slower in speed but it is capable of providing users with best security and encryption. OpenVPN connects the users through a bridge interface on a VPN server and it contains security provisions that work against both active and passive online attacks. You will also find many other features like suitability with all major OS, high speed, and ability to configure various servers to manage various connections simultaneously. It uses all the encryption and authentication abilities using OpenSSL Library. It also provides advanced bandwidth management ability to the users and it also offers various other tunneling options. SSTP: SSTP is a windows based SSL Protocol, and it can only run on Windows. You can use OpenVPN as an SSL client for your Mac or Linux PC. SSTP is also one of the most secure protocols and it cannot be blocked. All the internet traffic on SSTP is based on HTTPS port and it means that if someone blocks SSTP, they will also have to block all the websites that flow HTTPS port. SSTP protocol is also capable of bypassing all censors, restrictions and content filters. So, in the end we recommend you to go with one of the OpenVPN or SSTP protocols for your new VPN connection because these are capable of providing maximum security and encryption to your internet activity and you will be completely protection from any vulnerabilities of interceptions or hacks.